Anyone interested on having a meet up for our blue-tongued furballs? I have not seen another Chow in Chicago but from what I've seen in this and other forums, there seems to be an abundance of chowlings lounging around IL. I really wanna have my Shadow meet other chowlings and Chows seem to be hiding during the winter. LOL. Post if you are interested on making this meet up happen. Re: Chicago Chow Chow meetup! Wow! 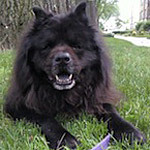 I have a chow named Shadow!!! He's everyone's favorite chow at the local DFA! Where in Chicago are you? We're up north, out Rogers Park way! Sorry for the very late reply. Anyways I'm around Jefferson Park area so North Chicago too.